Item Number: 810-1482BP410 18321 Actual Weight: 5 lbs. Provides a central location to organize lockout padlocks, tags, and hasps. 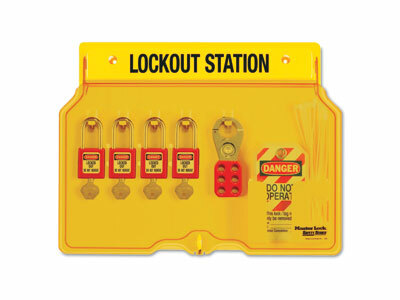 Virtually indestructible, one-piece construction eliminates loose parts and is lockable to prevent loss of safety lockout padlocks. Reinforced snap-lock clips provide easy padlock and hasp storage and removal. Translucent cover makes identification and selection easy. Safety hasps, tags, and padlocks included. Filled stations are keyed-different. Unfilled stations are also available.